Fire Evacuation Plans lay out how to exit a building quickly and safely due to; fire, smoke carbon monoxide or other emergency situation. A legal requirement in heavily populated buildings such as residential or commercial tower blocks, schools, hospitals, rail and office buildings. 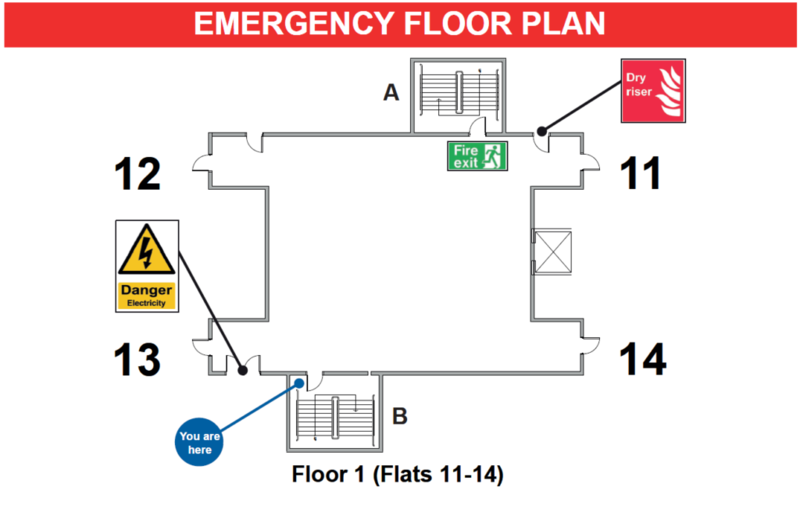 Designed for both floor or even room level to provide clear egress routes for residents and public whilst providing other pertinent information, will remain legible for longer in fire and/or smoky conditions to aid safe egress and evacuation by the Fire & Rescue Service. 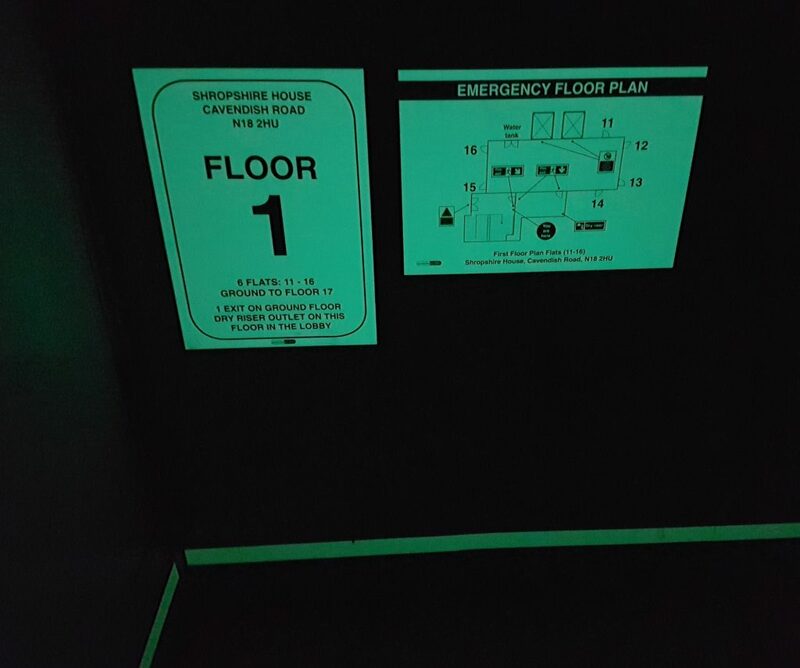 Emergency lighting is proven not suffice alone in ‘smoke fills’ so we have developed our photoluminescent primaDURA GLOW to provide a superior Class D Certified performance and safety product according to DIN 67510 Pt 1 & ISO 16069. This delivers durability and photoluminescent performance to the highest specification for residential, industrial and commercial signage or wayfinding applications. The 3mm stove finished aluminium sign has superior fire performance, being legible for longer in fire situations meeting international standards. Tested to Fire BS EN 13501-2 :2016 – complies with the requirements Classes B, dO and Passes BS 476-6:1989+A1:2009 (Class O) and BS 476-7 :1997 (Class 1) for Surface Spread of Flame and Fire Propagation. In premises where members of the public or persons unfamiliar with layout of the premises are present, primaDURA GLOW and associated photoluminescent Safety Way Guidance Systems (SWGS) are being increasingly sourced as authorities seek to improve access and egress methods. Please contact us at info@novadura.com for further information or +44 (0)1282 867 390 for a chat about available options or any of the detail above.